Over the past couple years I’ve discovered a few tricks while fishing the bays and marshes here along the upper Texas coast. Of the following, none will magically fill your stringer with a limit of fish. They may however help to save a little money, allow for fewer headaches, and achieve a better understanding of the waters you fish over time. The following are five tips that I feel are worth considering during your next fishing trip. If you’re anything like me, you keep about one hundred bags of soft plastics somewhere around your house. I can’t even begin to explain why I’ve purchased so many over the years, other than the fact that soft plastics on sale for a dollar are hard to pass up. Between shrimp, paddle tails, straight tails, and curl tails in brands, sizes, and colors that I doubt I’ll ever use. I probably have more than I could use in a lifetime. Instead of getting rid of them, I like to keep a pack of my least favorite color/style in my soft plastic binder to use while fishing under the birds. This is a great time to throw on soft plastics you’d like to get rid of because fish working the birds will hit just about anything put in their path. By doing so, you can save your favorite colors and styles for days when they’re actually needed. Taking out the kayak on really windy days can sometimes be a hassle. If you plan to cover several miles during a trip while the wind is blowing above 20 mph, you are going to have a tough time paddling into it at some point during the day. When these types of conditions occur I have found the best way to beat the wind is to use it to your advantage by launching from one spot and exiting at another. For this to work, you’ll need to fish with a friend and drive separate vehicles. You load both kayaks and gear into one vehicle and leave the empty one behind at the area where you plan to exit. You then drive back to your launch, unload, and start your drift, allowing the wind to blow you towards your exit. In this situation a drift sock is important because it will help slow your kayak which lets you really fish an area thoroughly; otherwise you end up drifting faster than you’d like. By using this tactic, you can cover several miles of water, fish the whole trip, and not have to paddle back into the wind. The key here is to choose your launch and exit according to wind direction. Of course, wind forecasts are not always correct so be prepared for anything. Exploring a marsh during low tides is a great way to really learn the layout and bottom structure of an area you enjoy fishing. When tides run lower than normal, they will sometimes reveal various channels, guts, and structure that are often hidden from sight. This is a great time to explore different areas that could produce for you in the future when the water returns to normal. One thing I like to make note of are the deeper channels that lead back into the marsh. 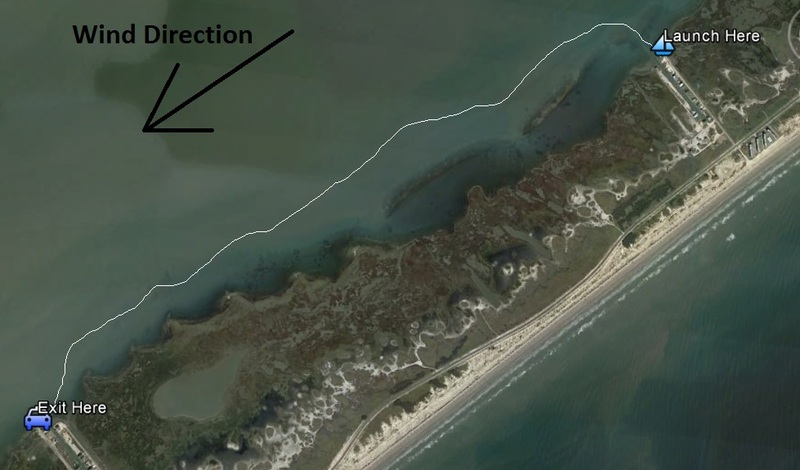 These areas will still hold water during a really low tide and serve as a sort of highway that fish use to move in and out of an area throughout the year. Identifying the location of hidden shell is also beneficial. Shell that is exposed during a really low tide can be hidden by more than a foot of water during a normal tide. 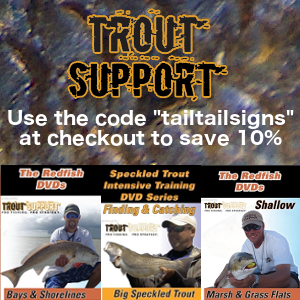 These areas serve as a great place to target redfish on a higher tide since baitfish like to stay near it for protection. The better you know an area you are fishing, the more success you are likely to have. While shallow areas will reveal a lot during a low tide, deeper areas will not give up as much information. Even on a low tide, you’ll more than likely never get to see much of what lies below the surface. In this case, the best thing you can do to really get a good feel for an area is to get out and wade. By doing so you’ll discover things you never would while sitting in your kayak. For instance, is the bottom sand, mud, scattered shell, grass, or a mixture of some sort? You’ll also better understand the depth you’re fishing by comparing it to your own height. While moving around, you’ll find small guts, patches of shell, and other changes in depth/structure where trout and reds wait to ambush their prey. Another advantage is that you are able to cover an area more thoroughly since you won’t be moving as quickly. Wading also gives you the ability to move through the water with more stealth, which lessens the odds that you’ll spook fish. One of the great things about owning a kayak is the ability to launch from just about anywhere. The downside is that some of these areas are in the middle of nowhere which makes your vehicle an easy target for thieves. Up to this point I have not had a break in and consider myself somewhat lucky. However, I do not believe luck has everything to do with it. One thing I’ll do when launching from areas where few people are around is make sure my truck is completely cleaned out the night before a trip. When I arrive at the launch and my kayak and gear have been unloaded, I will open every storage compartments in my truck (which are empty) before locking my doors. This includes the glove box, center console, sunglasses storage, and any other area that a thief believes something of value could be hidden. If I happen to have a few things that I did not take out, I will hide them under one of my seats before leaving. By doing so, you might make someone think twice before taking a chance to enter your vehicle for what appears to be nothing. Hopefully you are able to benefit from the above mentioned tips in some way or another. Always enjoy each trip and keep an open mind while on the water. You never know when you’ll learn something new that could pay off for you in the future. See this article and more at The Fisherman’s Journal by clicking the link below.